An unlikely addition to the retail landscape sits sandwiched between Kohl's department store and Maurices women's clothing at the south end of University Mall in South Burlington. 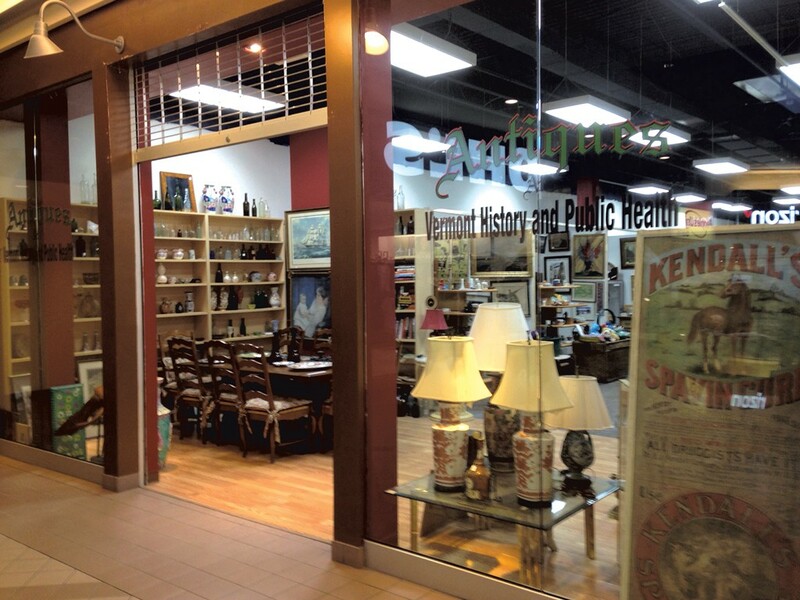 From the outside, the 2,800-square-foot Antiques at Vermont History and Health looks like a typical secondhand shop. But displayed among the old Buddha figurines, table lamps and dining room sets is an unusually themed collection of Vermont antiques: 19th-century medicine bottles, elixir and cure-all posters and advertisements, metal syringes, a Benzedrine inhaler. These and other curios, most of which aren't for sale, date from an age when Vermonters treated their ailments with over-the-counter remedies that boldly promised rapid cures. Routinely given to children, the elderly and the mentally disabled, many of these products contained dangerous and addictive ingredients such as alcohol, opium, morphine, laudanum and cocaine. The still-rough and largely uncurated exhibit, announced in early February, is part of a larger museum that is tentatively slated to open in Enosburg Falls this autumn to chronicle the history of Vermont's patent medicines. The goal, said the founders of the newly minted nonprofit, is to trace today's substance-abuse crisis to its roots in Vermont's thriving 19th-century pharmaceutical industry. As Seven Days first reported in a February 2018 story ("Poppy Culture: Is Vermont ready for a museum devoted to its history of opiate abuse? "), the museum is a passion project of longtime business partners Tim Camisa and Mike Rooney. In addition to businesses such the Lovermont 802 stores in the U-Mall and Burlington Town Center, Ethan Allen Coachworks in Williston, and Vermont Organics Reclamation in St. Albans, the pair own the Spavin Cure Building, a long-vacant historic structure on North Main Street in Enosburg Falls. Built in 1880, the three-story warehouse served for decades as the headquarters of the B.J. Kendall Company, founded by Enosburgh physician and drug maker Burney James Kendall (1845-1922). Among the company's numerous patent medicines was a hugely successful veterinary product called Kendall's Spavin Cure. Originally used to treat joint ailments in horses, it was later marketed and sold for human consumption. 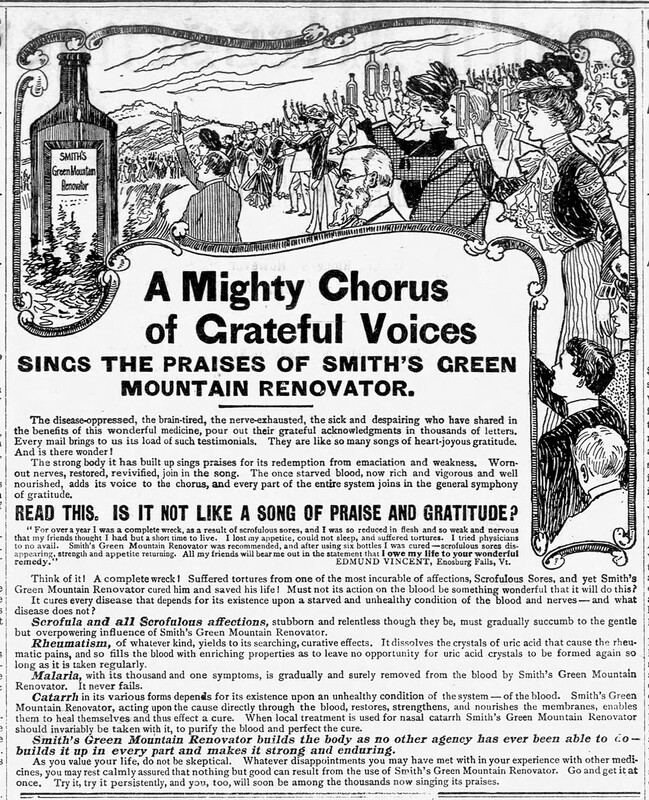 Many of Kendall's products, like other patent medicines manufactured in Vermont in those years, contained alcohol and opium. Since the Seven Days story was published last year, Camisa and Rooney have backed away from calling their project a "museum of addiction," choosing instead the more generic name Vermont History and Health. The decision wasn't made to mollify critics, Camisa said. But the project does have those. Some neighbors and business owners in Enosburg Falls have expressed concern that a museum devoted to recounting the history of substance abuse could attract unsavory characters, while also painting the town's past in a negative light. Though the Enosburg Business Association voted to endorse the museum, the Enosburg Initiative, an ongoing downtown revitalization effort, has declined to provide a letter of support to the museum's founders on four occasions. As news spread about the plans for the museum, the Spavin Cure Building was targeted by vandals who repeatedly smashed newly replaced windows, Camisa said. On a reporter's recent visit, he pointed out several freshly made bullet holes in third-floor windows. Whether the destruction was the work of bored teenagers or something more sinister aimed at the museum's creators, Camisa couldn't say. But inside the U-Mall store, no one seemed especially shocked by the antiquated drugs on display — or didn't even notice them. The father of one family of four, who'd just come in after shoe shopping at Kohl's, clearly hadn't noticed the medical items until a reporter pointed them out. "Interesting," he said with a half-hearted shrug. If last year's press drew criticism to the museum, it also helped the owners find a curator: Newton Rose, a 24-year-old historian and 2016 graduate of the University of Vermont. The Ludlow native read about the proposed museum just after returning home from his seasonal work at the Women's Rights National Historical Park in Seneca Falls, N.Y. He reached out to Camisa and Rooney, who hired him in March 2018. Since then, Rose has been developing the museum's first exhibit, some of which will appear in the U-Mall store in the coming months. Rose's first task, he explained, was to research artifacts recovered from the Spavin Cure Building during its renovation, some of which had been stuffed into the walls as insulation decades earlier. They include 19th-century marketing posters, newspaper ads, medicine labels, a business ledger and Kendall's original logbook from 1873. Rose is working with a paper conservator to ensure that these and other fragile artifacts are properly preserved, stored and displayed. His other big task is to interpret these objects and help connect them with the larger stories they tell. "This [museum] is about the history, ultimately, but you have to contextualize it," he said. "Then it makes today's issue [of substance abuse] more approachable. You understand that addiction has a history and isn't a moral failing." The museum's exhibits will draw heavily on Gary Shattuck's 2017 book Green Mountain Opium Eaters: A History of Early Addiction in Vermont. In it, the Shrewsbury author, a former Vermont State Police commander, assistant U.S. attorney and assistant Vermont attorney general, chronicled the widespread availability and consumption of opium, morphine, laudanum, alcohol and cocaine in 19th- and early-20th-century Vermont. Many of the museum's exhibits in Enosburg Falls, including a planned re-creation of a 19th-century Vermont apothecary, will feature B.J. Kendall Company products, given their abundance on-site. But, as Rose pointed out, the Enosburgh company wasn't the only one in Vermont that peddled addictive wares. Vermont history buffs will recognize the name of William Wells, the Union Army general and Battle of Gettysburg war hero whose statue now stands in Burlington's Battery Park. After the Civil War, Wells and his brother, Edward, took over their father's business, the Wells, Richardson & Company of Burlington. (The Wells Richardson Building still stands on College Street, as does Edward Wells' residence, which now serves as the UVM Alumni House.) One of the products they manufactured, Paine's Celery Compound, is thought to have contained cocaine, according to resources at the American Society of Anesthesiologists' Wood Library-Museum of Anesthesiology. Vermont History and Health's inaugural exhibit will focus on how these products were marketed beginning in the mid-1800s, Rose noted, an era that saw the rise of American consumer culture. 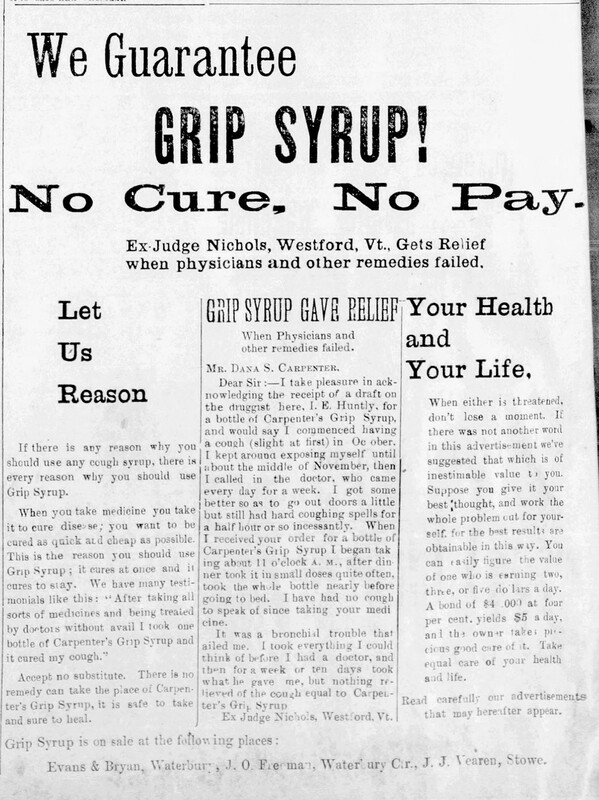 Elixirs, drugs and other home remedies were some of the first products marketed to Vermont consumers. Camisa pointed out that B.J. Kendall had state-of-the-art printing presses on-site for producing its own marketing materials. No federal laws governed the contents, safety or advertising of its products until the passage of the U.S. Food and Drug Act of 1906. Consider one promotional item on display in the U-Mall store for B.J. Kendall's Blackberry Balsam. 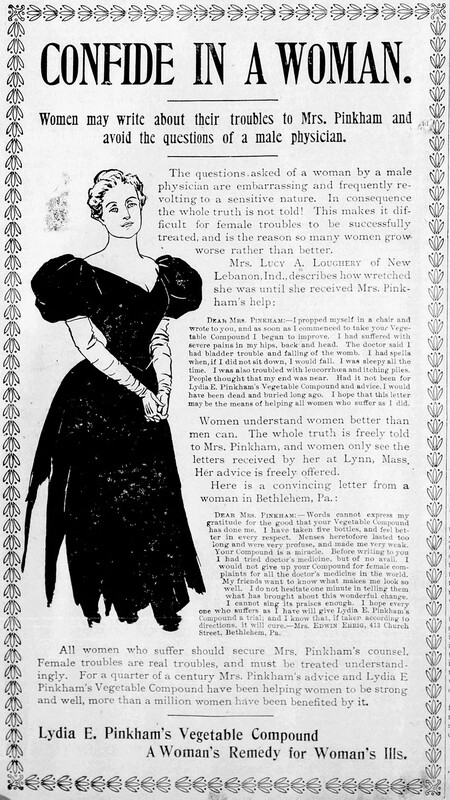 "Warranted to cure cholera, cholera morbus, dysentery and all summer complaints," the product is touted as "the most wonderful remedy of the age" and "perfectly safe in all cases and specially adapted for children." As Rose confirmed through his research, Blackberry Balsam actually contained narcotics such as opiates. "What these companies were trying to do was be memorable. But they're also trying to instill confidence," Rose said. "This was a time when some doctors were still doing bloodletting and leeches ... So there wasn't the same trust in medicine that there is today." The irony of placing a history exhibit dedicated to the perils of consumer culture inside a shopping mall isn't lost on Rose. But then, the whole point of the museum is to draw connections between then and now. As an example, Camisa pointed to the glad-handing of the modern pharmaceutical industry. As recently as the 1990s, he said, the limousine service he and Rooney operate often transported Vermont physicians and their spouses to New Hampshire resorts for medical conferences, where industry reps handed out free drug samples. While making such connections, though, the museum's creators hope to be sensitive to those whose lives have been touched by today's opioid crisis. To that end, Camisa and Rooney reached out to Gary De Carolis, executive director of the Turning Point Center of Chittenden County, which helps people in drug and alcohol recovery. De Carolis — himself a history buff who runs Burlington History Tours as a side business — agreed to review the museum's exhibits and offer his feedback. "I think it's a great idea," De Carolis said of the museum. While he's not sure how many Vermonters will make the trip to Enosburg Falls to visit a history museum about 19th-century patent medicines, he hopes some of its exhibits will eventually travel to schools and communities throughout the state. Camisa confirmed that now that the museum has secured its 501c3 status the partners will apply for grants to do just that. In the meantime, Camisa and Rooney expect their U-Mall exhibit to attract incidental foot traffic; the mall receives 2.8 million shoppers annually, according to its management, KeyPoint Partners. Heather Tremblay, KeyPoint's vice president of property and asset management, wrote by email: "Offering customers entertaining and educational experiences at the mall is an emerging national trend and we are pleased that Tim has opened his museum at University Mall." As for the larger museum in Enosburg Falls, which the partners hope to open in time for fall foliage, Camisa thinks it could attract the "dark tourism" contingent — visitors who gravitate to sites that highlight the grittier and less savory aspects of history. He's not worried that the museum could inadvertently glorify substance abuse — a phenomenon by which he's also been touched. Camisa admitted that, when he was interviewed for the 2018 Seven Days story, he "wasn't forthcoming" about his own history of substance abuse. This time, he revealed that for several years in his late teens and early twenties he was addicted to cocaine. "I know what I went through. And I've done well for myself," Camisa said. "I'm going to tell the truth here — I can't present pretty Victorian times ... If we don't do that here, how do we keep from repeating this problem?" The original print version of this article was headlined "Remedies of Old"